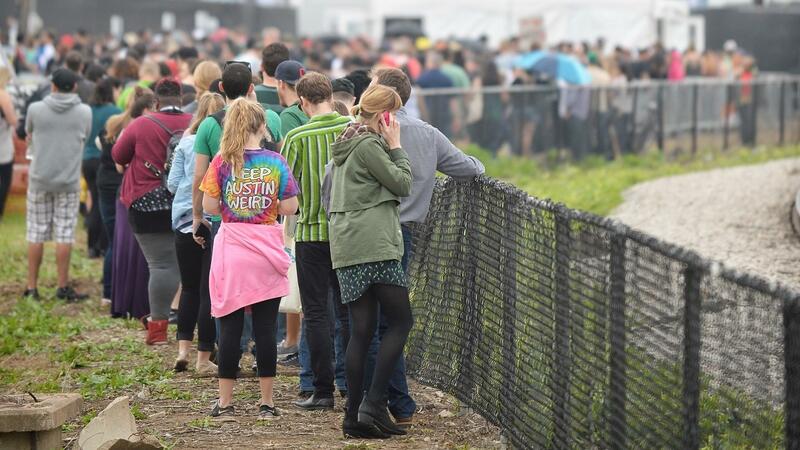 A crowd in line at the 2015 SXSW music festival in Austin, Texas. 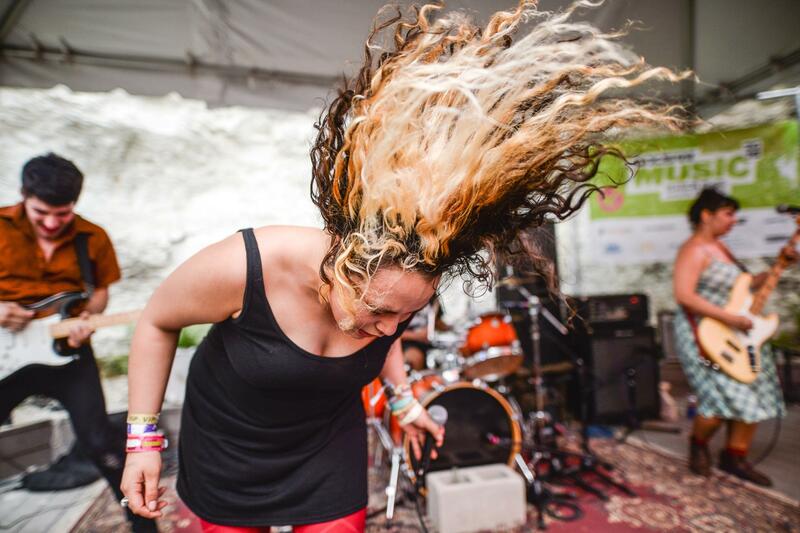 Victoria Ruiz of Downtown Boys performs at SXSW 2016. One week and a day before thousands will descend on downtown Austin for South By Southwest 2017, what seemed like a standard bit of legalese in contracts given to artists performing at this year's SXSW music festival has, amidst a markedly shifted political climate, erupted into controversy. Musicians have accused the festival of threatening foreign performers with deportation if they appear outside official festival venues. The controversy began online Thursday afternoon, when a drummer named Felix Walworth (who is gender non-conforming, and uses "they" and "their" as pronouns) canceled a South by Southwest showcase via Twitter. Walworth, who leads the band Told Slant and is also a member of other groups including Eskimeaux and Bellows, wrote in two separate tweets about their cancellation: "I'm not interested in aligning myself with an institution that interacts with immigration authorities as a means of ... controlling where art is shared and performed, and who makes money off of it." Walworth did not respond to NPR's requests for an interview. Later yesterday, following coverage from several media outlets, an open letter calling for SXSW to apologize for "their attempt to collaborate with Immigration and Customs Enforcement" and to "cease any collusion with immigration officials that puts performers in danger" was published. The letter was signed by 35 artists and labels, including PWR BTTM, who is scheduled to play NPR's official showcase during the festival. Central here is understanding the types of visas that international musicians use to travel to the Austin festival. SXSW's guidelines for artists invited to the festival note that any artists who arrive in the country on a non-work ("tourist") visa, or who are here as a citizen of one of the nearly 40 countries that participate in the United States' Visa Waiver Program, may be reported to authorities if they are found to be in violation of the government's travel guidelines. As Leena Khandwala, an immigration attorney based in New York, explains: "Tourist visas are for foreign nationals visiting the U.S. temporarily." Bands coming to the U.S. to tour — or those playing an unofficial showcase during SXSW for which they may be paid — "would have to have an employment type of non-immigrant visa: an O visa or a P visa." Speaking on background, those who work with international artists in the touring industry say clauses such as the one in SXSW's contract are not uncommon anymore. Roland Swenson, co-founder and CEO of SXSW, says that the contract language is actually intended to help the thousands of musicians who travel to Austin. "[In the contract] we gave the artists a list of: 'If you violate your visa, this is what could happen,'" he says. "It's being interpreted as "This is what we're going to do to you.'" A statement released yesterday by SXSW said that the 30-year-old festival had never reported an international act to immigration authorities. Swenson also notes that acquiring a work visa is an expensive process that takes months of preparation, and requires visa applicants prove that they are already accomplished musicians. "If the artists had to qualify for other types of visas," he says, "they might not have the career credentials to gain those." While SXSW's contractual intent may be benevolent, Swenson didn't help his festival's public relations in an interview yesterday with The Austin Chronicle, in which he insinuated that artists were using disagreements over the contract to promote themselves. "I think that everybody has figured out that a quick way to get your name out there is to accuse us of conspiring with immigration authorities," he told the paper. At best, it was a tone-deaf response to concerns voiced by the kind of artists — emerging, often independent — upon which SXSW's reputation has been built. Artists, though, also seem to have put the bellows to a fire they didn't fully understand. Despite Walworth's mistatement, SXSW has not interacted with immigration authorities to control where art is shared, but rather drafted a fairly standard contract warning of the limits placed on visiting artists. Victoria Ruiz is the singer of the band Downtown Boys and a co-writer of the open letter. Her band has played SXSW in previous years and is scheduled to perform at the festival this month. She told NPR: "I don't know visa requirements on both sides, so I can't speak to that. I think there is a really big issue ... if SXSW has sole discretion, our hope would be that they would explicitly say, 'We would never use our discretion to get an artist involved with immigration.'" This is an impossible ask. An easy metaphor would be the terms of service language signed by users of a web browser to absolve the browser's creators from culpability in the event that it is used to violate laws. SXSW, in order to facilitate thousands of concerts within a very short period of time, asks visiting artists to sign a similar agreement. For a musician and activist like Ruiz, who says she has spent time in the last year advocating on behalf of immigrants' rights, the line, especially in such an unpredictable political environment, is clear. "Right now," says Ruiz, "especially under the Trump administration, everyone needs to pick a side." But Swenson argues that SXSW's offerings have become more diverse specifically because the festival has helped international artists find their way to Austin as simply — and cheaply — as possible. "You know," he says, "we've managed to build this event that allows hundreds and hundreds of acts — who are for the most part unknown — to come and play at a festival in the U.S. I think we're the only ones who have done that on the scale that we have." Musicians who have signed the open letter are considering whether or not they will withdraw from this year's edition of SXSW. What at first seemed like a standard bit of legalese has now created a controversy. The language appears in the contracts given to artists performing at this year's South by Southwest music festival. Musicians accuse the festival of threatening foreign performers with deportation if they play outside of the festival's official venues. NPR's Anastasia Tsioulcas untangles the situation. ANASTASIA TSIOULCAS, BYLINE: For foreigners, getting a visa to visit the United States can be pretty complicated. And for musicians hoping to introduce themselves to an American audience, figuring out exactly what kind of visa they need and what they can do while they're here can be even more confusing. Leena Khandwala, an immigration attorney based in New York, explains the basics. LEENA KHANDWALA: So tourist visas are for foreign nationals who are visiting the United States temporarily for business or pleasure. TSIOULCAS: People here on those visas or who are from one of the nearly 40 countries who don't need a visa to visit the U.S. can do a bit of soliciting of new business while they're here. KHANDWALA: Such as meeting with clients, attending a conference or a convention, you know, negotiating a contract, attending a board meeting, those kinds of activities. TSIOULCAS: And that could include doing one official performance at South by Southwest, one of the world's premier platforms for musicians. But if they want to do more, Khandwala says, foreign performers need another kind of visa. KHANDWALA: If they were coming on a tour, they would have to have an employment type of non-immigrant visa, an O visa or a P visa. TSIOULCAS: For years, the South by Southwest artist contract has contained language outlining those visa basics and outlining what could happen if musicians break the rules. That's according to Roland Swensen, the festival's CEO and one of its co-founders. ROLAND SWENSON: We gave the artists like a list of, if you violate your visa, these are the things that could happen. And that's being interpreted as, this is what we're going to do to you. TSIOULCAS: Off the record, people who work in the touring industry say that seeing these kinds of clauses in artist contracts is not uncommon anymore. But yesterday afternoon, a drummer named Felix Walworth canceled a South by Southwest showcase via Twitter, objecting to the contract language. Walworth did not respond to NPR's request for an interview. But a number of other artists have signed an open letter calling on the festival to, in their words, cease any collusion with immigration officials that puts performers in danger. Among them is the band PWR BTTM, which is slated to perform at a showcase that NPR is curating at the festival. Another is singer Victoria Ruiz of the band Downtown Boys. VICTORIA RUIZ: As someone who is very upset with the current political moment and is seeking ways to resist, this seems like a very logical step to take because these artists are the people who make South by Southwest what it is in terms of its art. TSIOULCAS: The festivals, Roland Swenson says, its longstanding position has only meant to help foreign artists by getting them here using the simplest and cheapest visa. SWENSON: We've managed to build this event that allows hundreds and hundreds of acts, who are for the most part unknown, to come and play at a festival in the U.S.
TSIOULCAS: Musicians who have signed the open letter are considering whether or not they will withdraw from this year's South by Southwest. Anastasia Tsioulcas, NPR News, New York. Transcript provided by NPR, Copyright NPR.